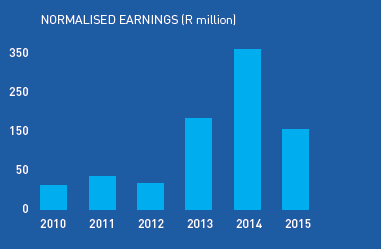 Following record profits in 2014, normalised earnings fell 50% in 2015 from 111 cents per share (cps) to 55 cps. Headline earnings per share (HEPS) fell by an even greater 67% from 112 cps to 37 cps due to the anomalous accounting treatment of the bargain purchase gain that arose from the acquisition of the Bayside casthouse by Isizinda. This is explained in detail later in this report. Results for the first six months were heavily impacted by production constraints arising from load shedding, quality issues and a planned maintenance shut. Manufacturing performance in the second six months was much improved but it was not possible to make good the volumes already lost and Rolled Products sales volumes for the full year ended 9% down on 2014. Results for the second six months were heavily impacted by external factors. 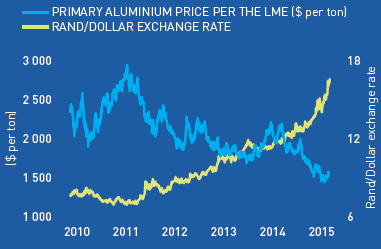 The aluminium price quoted by the LME fell sharply and the average price in 2015 was down $372 per ton (20%). As a result, a loss of R161 million arose from the unhedged portion of metal transactions compared to a gain of R53 million in 2014. A slowdown in Chinese domestic consumption saw a rise in Chinese exports in the second half of the year and this, coupled with sluggish global demand and lower geographic premiums, resulted in rolling margins, Hulamin’s selling price over metal, declining in the later part of the year. Operating cash flow amounted to R124 million for the year, down from the R518 million recorded in 2014 due to lower profits and higher rand equivalent receivables. Net capital expenditure, including the establishment of Isizinda and a large portion of the new aluminium recycling plant, totaled R543 million. No final dividend in respect of 2015 has been declared. However, both the 2014 final dividend and 2015 interim dividend, amounting to R105 million, were paid during 2015. Net borrowing increased from R437 million at the beginning of the year to R975 million at year end representing a net cash outflow of R 538 million. International Accounting Standard (IAS) 36 requires that management assess the carrying value of assets at every reporting date for possible impairment in value. Where the share price of a listed entity trades at a discount to its underlying net asset value, as is the case at Hulamin, management are obliged to determine the value in use of the assets and should this be below their carrying value, make an appropriate adjustment. A full value in use computation was done at the balance sheet date and no adjustment to the carrying value of assets was indicated. Full details are provided in note 20 to the financial statements and the determination was reviewed by the company’s external auditors. Key sensitivities are explained in the note and the rand/dollar exchange rate assumed is a key determinate of the value in use of the assets due to the impact of the exchange rate on profitability. The valuation assumed a rise in the average rand/dollar exchange rate from R12,76 in 2015 to R15,59 in 2020. Hulamin has consistently followed a policy of hedging 50% of its metal price risk exposure and 100% of its currency risk exposure. On average, Hulamin buys and sells the same amount of aluminium each year. The metal price is determined with reference to the LME (London Metal Exchange) and is typically priced on the monthly average LME price in the month prior to the month of delivery. It usually takes about three months to produce and invoice the semi-fabricated products sold to customers and during this period the quoted LME price may go up or down creating an exposure to price risk. Hulamin uses derivative instruments, forwards and swaps, to reduce the exposures to 50%. Eliminating 100% of the price risk with derivatives would create a cash flow risk if the price of metal were to rise strongly since new inventory would have to be purchased at a higher price than the proceeds received net of derivative settlements. In the 2013 financial year, Hulamin made a net pretax loss of R58 million from metal price lag and in 2014, a pretax gain of R53 million. In the current year a pretax loss of R161 million was recorded. This net loss was made up of dollar denominated losses on the purchase and subsequent sale of metal offset by gains on derivative instruments. The related currency gains arising from the weaker rand /dollar exchange rate which amounted to R284 million were fully hedged out in accordance with Hulamin policy. In the light of the magnitude of the loss in 2015, the Board reconsidered in detail Hulamin’s hedging policy at the February board meeting. The Board concluded that the current policy of hedging 50% of metal price risk and 100% of currency risk remained the most appropriate and would continue to be implemented. The starting product for Hulamin’s Rolled Products is rolling slab in various alloy formats. Hulamin casts approximately two thirds of its rolling slab at its Pietermaritzburg cast house and buys in the other third from the Bayside casthouse, previously owned by BHP/South 32. BHP/South 32 had wanted to exit the Bayside casthouse business for some time and in order to ensure continuity of rolling slab supply Hulamin entered into a partnership with Bingelela Capital to form Isizinda Aluminium owned 60% by Bingelela and 40% by Hulamin. Isizinda then acquired the Bayside casthouse effective 1 July 2015 for R100 million. The purchase price was financed by a loan from Hulamin and the terms of the loan included a restriction on the payment of dividends by Isizinda for so long as the loan remains unpaid. This restriction, together with the fact that Hulamin is currently Isizinda’s sole customer, resulted in Isizinda being classified as a subsidiary of Hulamin in terms of accounting rules notwithstanding the fact that Bingelela own 60% of the share capital. Consequently, the accounts of Isizinda have been fully consolidated into the Hulamin Group Accounts in 2015. It is intended that Isizinda will develop an aluminium hub at Bayside which will have several participants and once this is achieved it will no longer be classified as a subsidiary of Hulamin. The transaction was accounted for as a business combination in terms of IFRS 3 and in terms of its requirements a bargain purchase gain of R52 million was identified as arising from the valuation of land and buildings based on an imputed income capitalisation methodology reduced by the estimated cost of remedial works required to realise such income. This gain was included in operating income but excluded from headline earnings and normalised earnings. Given that Isizinda was classified for accounting purposes as wholly owned by Hulamin the 60% portion of the bargain purchase gain that would ultimately belong to Bingelela needed to be given effect to in some other form. This was done by assuming that Hulamin had granted Isizinda an option to acquire 60% of the shares in Isizinda once the Hulamin loan was repaid. A charge of R27 million, 60% of the adjusted bargain purchase gain, was made against operating profit and normalised earnings to achieve this. However, even though the total bargain purchase gain of R52 million was eliminated from headline earnings, the R27 million charge in respect of the share of the gain attributable to the Bingelela shareholders remained. This lowered headline earnings by R27 million and distorted the comparison to prior year and other measures. Consequently HEPS was shown as falling 67% whereas normalised EPS fell by only 50%. Inventories ended the year at record lows in terms of tons and at R1,8 billion were 9% lower in rand terms than in 2014. Good progress has been made in this key area and the appointment of a new senior manager to head up the operations planning department has made a big difference.The nature of the business is such that metal purchases are committed well in advance of sales and this makes accurate demand forecasting an imperative. Order deferments/cancellations and plant disruptions can lead to rapid inventory build ups and associated cash flow demands if not dealt with expeditiously. Rand receivables increased by 32% over 2014 due to high invoicing in the fourth quarter and the impact of the rapid deterioration of the rand dollar exchange rate towards the end of the year. All receivables are insured with a 10% deductible and the quality of the book remains excellent. Trade payables were well down on the prior year reflecting lower purchases in the fourth quarter and the impact of a large delayed payment that was outstanding at 31 December 2014. There was a sharp rise in derivative liabilities to R236 million at the year end. These are currency FECs that have been marked to market and reflect the weakening of the rand at the end of 2015. There are related offsetting foreign currency assets in the form of dollar receivables and metal inventory. 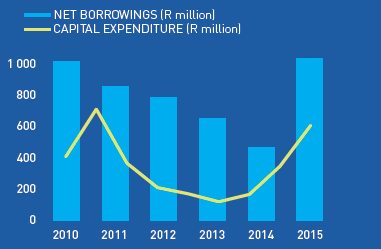 Net borrowings closed at R975 million, up R538 million on the prior year. Borrowings comprised a R270 million term loan, a R703 million revolving working capital loan and a R72 million loan from the employer surplus in the pension fund reduced by cash balances of R70 million. Committed facilities total R1 592 million leaving headroom of R547 million at year end. In addition, there is a short term uncommitted R250 million standby facility. The current three year committed facilities were put in place in 2013 and will terminate in September 2016. Negotiations are in progress to establish committed facilities for a further three year period thereafter and given the successful operation of the current arrangements there is every reason to expect a successful conclusion to the negotiations. Funding requirements in both 2014 and 2015 were heavily impacted by capital expenditure of R340 million in 2014 and R573 million in 2015. Capital expenditure in 2016 is budgeted to be significantly lower as no major projects are planned and much of the underspend in prior years has effectively been caught up. The previous structures that were in place unwound with little or no vesting. At the 2015 annual general meeting, shareholders approved a new Strategic partner arrangement and a new Employee Share Ownership Scheme subject to certain conditions precedent. Resolving these conditions was not without challenge but the schemes have now been implemented and full details are contained in note 33 of the Integrated Report. The new B-BBEE codes have come into effect and Hulamin will be rated under the new codes in 2016. Despite the fact that the ownership structure of Hulamin will meet the key requirements, the substantial changes made in other areas of the codes will mean that Hulamin will be unable to maintain its current level 3 rating under the new codes.